Ready to Say these Two Words After Taking the NMLS Exam? Even if you have NO real estate experience? Even if you have NO time to spend on studying for the exam? Even if you’re taking the exam for the FIRST time ever? Affinity’s NMLS Approved Course is a ten-day online course that requires 2-3 hours per day to complete. The course is offered every Monday-Friday. A 10-day, instructor-led online course that requires 2 to 3 hours/day to complete. Freshly updated and easy-to-understand video tutorials AND worksheets. New material released EVERY DAY!!!! 5 Unmatched Success-Boosting Bonuses, including access to a members-only Facebook community! ONE chance for a FREE reschedule. If you can’t complete the course in the required timeframe, the NMLS requires retaking the course completely. Crafted by our lead instructor and subject matter experts so you get the latest and best information in the least overwhelming way. Unlike other online courses where instructors drone on and on, our courses are known (and LOVED!) for being engaging and actually, entertaining! Most importantly, you’ll walk away with complete confidence over everything you need to know in order to ace your NMLS exam with this self-paced, highly interactive, online course. That’s right. Most students aren’t prepared for the complex questions and the intricate relationships between different rules and regulations. They take any online class available and try to cram answers to questions without understanding concepts. It’s not enough to just memorize “questions and answer”! You must understand “why” the answer “is” the answer and how the different rules and regulations interact with one another. In this session, you’ll understand the ethical behavior related to MLOs including fairness in lending, fraud detection and more! Topics on key concepts including: federal regulations, privacy protection, consumer ID, and predatory lending protection laws, government loan programs, the SAFE Act, and financial calculations. You’ll understand everything there is to know about non-traditional mortgage products. You need to take this course from a desktop computer or laptop. Use of mobile devices, such as, cell phones, iPads and tablets is prohibited by the NMLS. Affinity’s courses have a 92% success rate. Check out our reviews on Yelp to know that we take your success very seriously. ✔️ 3 hours of Federal Lending Legislation: You’ll master federal-related mortgage laws and regulations including Real Estate Settlement Procedures Act (RESPA Regulation X), Equal Credit Opportunity Act (ECOA Regulation B), Truth-in-Lending Act (TILARegulation Z) and so many more so you understand these concepts and not just what they stand for! ✔️ 3 hours of Ethics: In this session, you’ll understand the ethical behavior related to MLOs including fairness in lending, fraud detection and more! ✔️ 2 hours of Non-traditional Mortgage Products: You’ll understand everything there is to know about non-traditional mortgage products. ✔️ 10 hours of elective topics on key concepts including: federal regulations, privacy protection, consumer ID, and predatory lending protection laws, government loan programs, the SAFE Act, and financial calculations. ✔️ 2 hours of California-specific material designed to cover the CA-DBO regulations.  Plus … there are boost-your-success bonuses! Each student will receive a 45-minute video/audio recording of the most important points and facts to remember in order to pass the NMLS National Exam. Get real-world practice for the NMLS exam with these sample tests so you not only understand the test outline but also get to assess your own preparation and fine tune it! You’ll get complete access to the slides used during the course. These will help you review and revise the material from the comfort of your home and if you need to brush up on concepts right before the exam! You’ll get a copy of the “Successful Student Study Guide”. 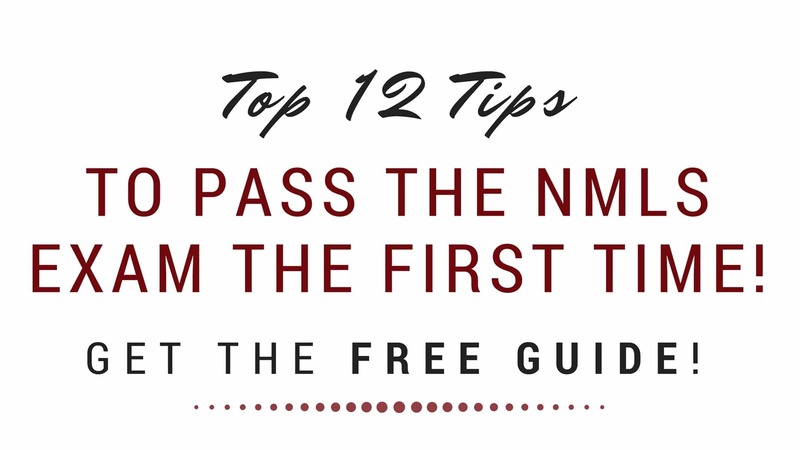 You’ll get a copy of the 12 TIPS to Passing the NMLS guide. You’ll get a copy of the Step-by-Step Guide to Obtaining an NMLS License. Way too little for the value that you’re getting! “I took the 20 hour live class and it allowed me to get 80% on the exam. Great class to prep you for the exam! “I went to Yelp to find out who was the best in NMLS training and saw consistent 5 stars with Artricia and Affinity. 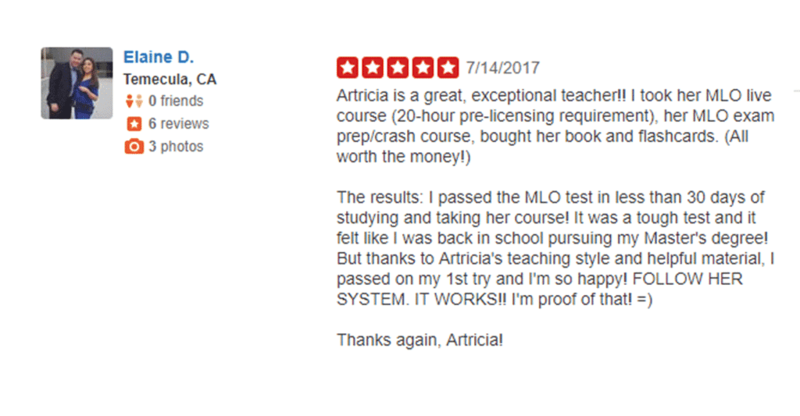 After taking her 20 hour pre-licensing and NMLS crash course, I understand why. 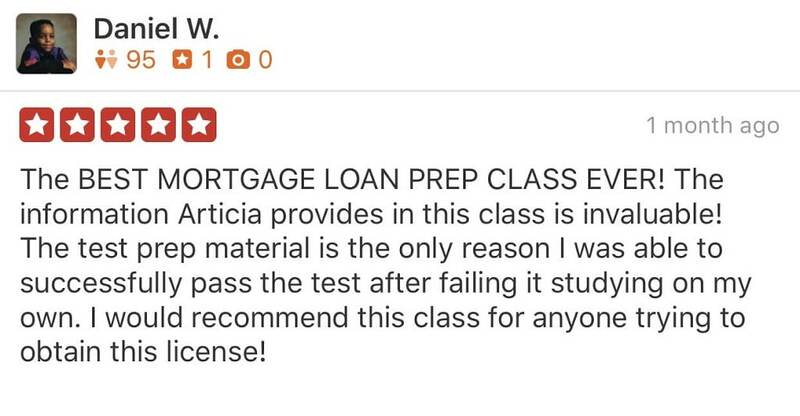 Artricia is passionate about wanting you to pass on your first attempt. I registered for the NMLS years ago, but the phone book I received to study from discouraged me from studying. With Artricia, I went to class studied a very small concise booklet, took notes and listened to her provided audio guides in the car. I am happy to say that I passed with a 91% on my first attempt. I am an old school loan officer from the glory days. This is the first exam I have had to take in over 20 years. Artricia’s Exam Prep class is superb! I’d taken the test before and didn’t pass. I tried other online test prep courses with no success. I finally decided I needed the benefit of a LIVE class; which in fact, is rare to come by. I found Artricia’s class and jumped at the opportunity! I want to share the great news that I passed my exam yesterday!! I took your Crash Course, June 17th and my exam date was June 26. Your live Crash Course and all the extra study material you provide ARE extremely helpful. I would recommend anyone to attend your class before taking this test. It sure would of saved me $110 the first time! LOL! Overall, l want to thank you for all your incredible input and also being available through email whenever I had any questions. Who’s Your Guide to NMLS Exam Success? creator of the MLO Training Academy and director of training and senior instructor at Affinity Real Estate and Mortgage Training. 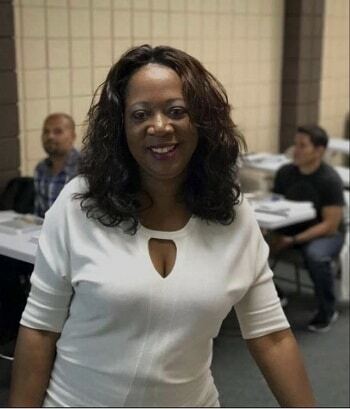 Armed with a Master’s degree in Business Management and with over 15 years of experience as a real estate broker and mortgage expert, I have a fiery passion for empowering fellow professionals to maximize their earnings by gaining the credibility and qualifications needed. An award-winning mortgage expert, broker, and speaker, I specialize in customer service, mortgage origination, training, and consulting, ensuring that professionals and businesses get the best education when it comes to real estate and mortgage rules and regulations! When I’m not teaching at the MLO Training Academy, I’m speaking on NMLS pre-licensing, prep and continuing education all over the country… or snuggling with my sweet grandson!! You walk into the hall with your heart hammering against your chest but you have a calm exterior and sweat-free confidence oozing from every pore. You sit down and start the 125-question exam. The computer-generated, multiple-choice questions exam doesn’t faze you. You are now, officially, a Mortgage Loan Originator and your future is definitely brighter and better. Are YOU ready to turn this picture into reality?